Your Samsung Galaxy Note 3 is blessed with abilities far beyond those of a mere mortal phone. These features would have been scoffed at in the 1940s, ridiculed in the 1950s, met with blank stares in the 1960s, yearned for in the 1970s, and, finally, achieved in the 1980s, but at exorbitant monthly fees. How fast can you dial a phone? Don’t even try to attempt a new speed record. That’s because the Galaxy Note comes with a Speed Dial feature that will put any of your attempts to shame. Luckily for you, speed dialing can be enabled in seven simple steps! If necessary, touch the Keypad tab to see the phone-dialing screen. Blank numbers have plus icons on them. Choose a contact to speed-dial. 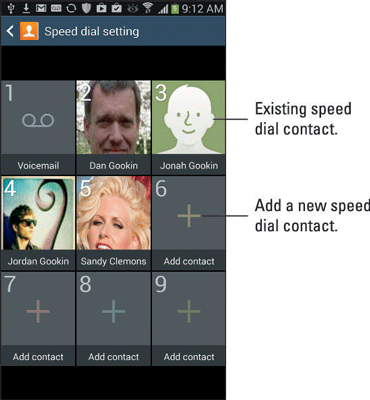 Repeat Steps 5 and 6 to add more speed dial contacts. When you’re done adding numbers, press the Back button to exit the Speed Dial Setting screen. Using speed dial is simple: Long-press a number on the keypad to dial a contact. When you release your finger, the speed dial number is dialed. To review your speed dial settings, follow Steps 1 through 4 in this example.